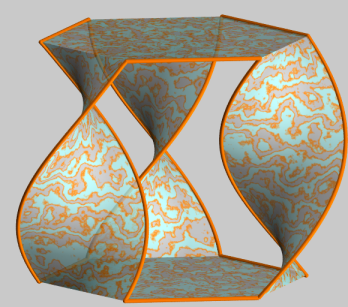 Surfaces studied by Seifert in 1934. 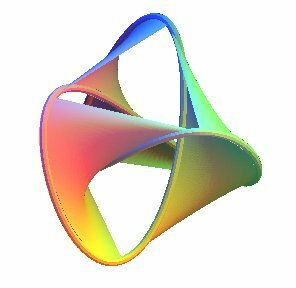 Herbert Seifert (1907-1996): German mathematician. 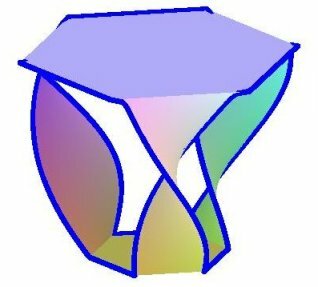 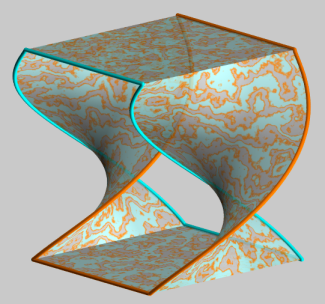 A Seifert surface associated to a smooth closed curve without self-intersection of space (in other words, a representative of a knot) is an orientable connected compact surface without self-intersection the boundary of which is this curve. 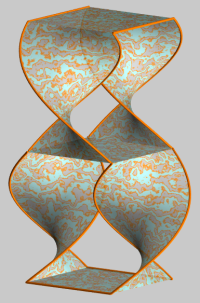 The Seifert theorem provides the existence of this surface, that is of course not unique. 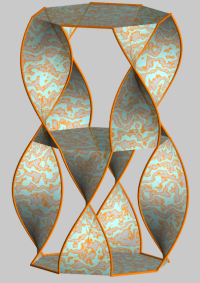 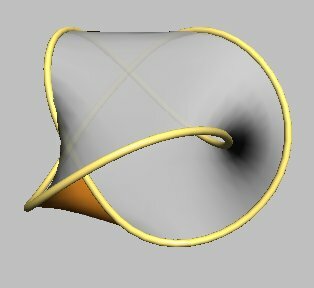 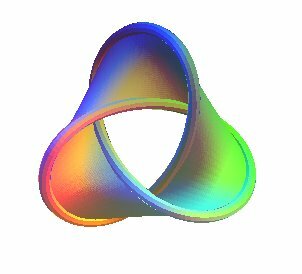 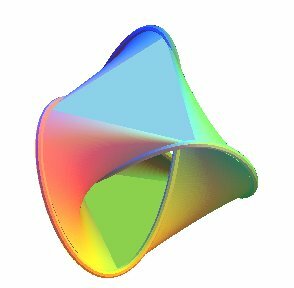 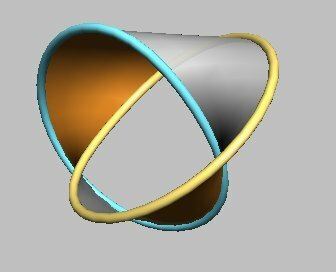 Much as the disk is obviously a Seifert surface associated to the trivial knot, one could think of obtaining a Seifert surface associated to the trefoil knot by joining each point of a curve to the farthest point of the curve by a segment line. 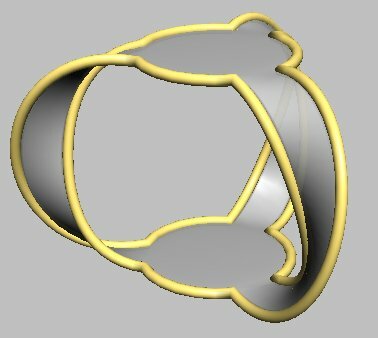 However, the surface obtained in none other than the Moebius strip with 3 half-twists, which is not orientable. 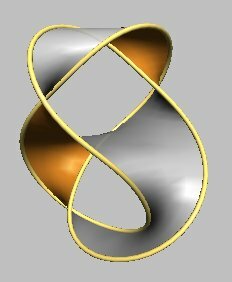 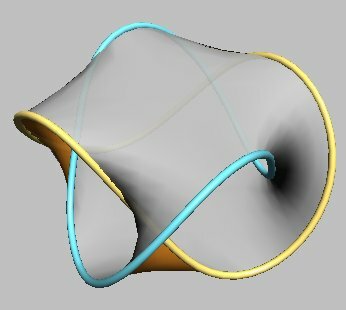 To get a Seifert surface with a trefoil knot as boundary, we can trace a segment line between a pair of vertices at the top and make it move to a pair of vertices at the bottom, three times (figure at the center), and complete the two triangles. 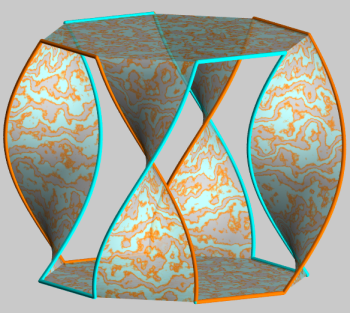 The resulting surface has indeed two faces (note for example that the upper face of the upper triangle leads to the upper face of the bottom triangle). 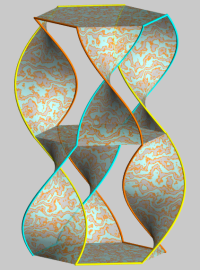 The notion of Seifert surface can be extended to links. 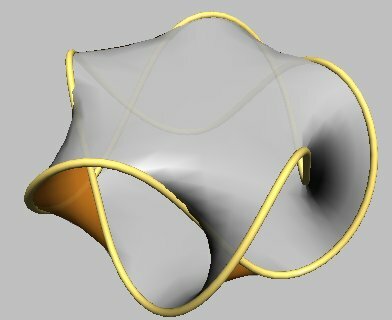 Opposite, the example of the Hopf link; the surface was obtained by moving a segment line joining the two disks (like in the previous examples, it is therefore a portion of ruled surface). 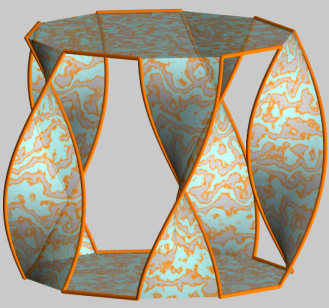 More generally, a table with p trays and q legs, with the legs all twisted in the same direction, corresponds to the the toroidal link of type (p, q). 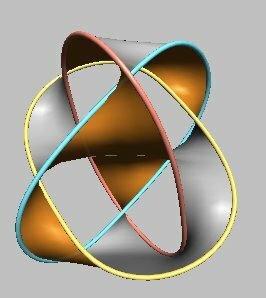 Any knot or link can be represented by this method, with any number of trays and legs, having any number of twists.